Posted on Tue, May 7, 2013 : 5:59 a.m.
Editor's note: This article has been corrected to reflect Teresa Gillotti's correct title. She is the Ypsilanti city planner, not the city manager. Less than three years after promising to bring hundreds of new jobs to Washtenaw County, Angstrom USA, LLC is looking to sell or lease its plant facilities in Ypsilanti. Angstrom is looking to shed all or part of the 715,000-square foot property, listing it with Signature Associatiates, the same company that managed Angstrom's purchase of the property. 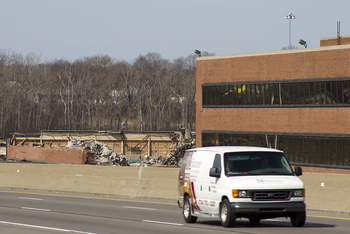 Parts of the former Visteon plant owned by Angstrom USA have already been demolished. A sign advertising the vacant lot next to the plant has been on display at the property, located at 126 Spring Street, for over a year. Angstrom bought the property from Automotive Components Holdings LLC in late 2009. The plant, previously 1 million square feet, had been a Visteon facility. Parts of the plant have already been demolished. Angstrom, a tubular parts manufacturer, planned to bring up to 400 jobs to the plant but has struggled to secure contracts from the Big Three automakers that would allow the company to ramp up production in Ypsilanti. Listing agent Brad Viergever said the company is not manufacturing any parts at the plant but could have some production at the facility in the future. “They don’t feel that they have enough production work to fill the entire building, so they are willing to lease portions of the plant for warehouse or manufacturing uses,” he said. The property is zoned as an industrial space, but city planner Teresa Gillotti said it could be developed for other uses. “Once you’re over an acre you can come in and say you want to do something different and the city will work with you on development options,” she said. The listing price for leasing the property is $2.50 per square foot annually. Viergever said the price could be negotiable, depending on the tenant and how much of the plant the business wanted to take over. For sale, Angstrom is asking for $9.8 million or $13.71 per square foot. According to the city website, Angstrom purchased the plant and the lot for $2,000,000 in 2009. The plant’s assessed value for tax purposes is $754,000, giving it a market value of about $1,500,000. The parking lot was last assessed at $150,700, making its undeveloped market value about $300,000. Angstrom representatives could not be reached to comment on plans for the parking lot or the plant. Tue, May 7, 2013 : 7:10 p.m. It would be nice if they could find a developer that is interested in bringing jobs to the community while also thinking of our young children that have nothing to do around the Ypsilanti area. Why not build a children's complex and that would also bring the jobs that are severly needed. Wed, May 8, 2013 : 1:14 p.m. There's plenty for children to do...classes, recreation, parks, libraries with free programs...but getting involved with various activities requires parents who are interested in raising their own kids. Tue, May 7, 2013 : 4:49 p.m. There were no incentives in place when Angstrom purchased the property. In fact, both the city and the township were somewhat taken by surprise at the purchase. Angstrom was consolidating operations from all over the country at this site, because at the time the state was offering very generous incentives to companies that moved to Michigan. Angstrom started work on renovating the plant, but soon after, Governor Snyder gutted the incentive program as part of his &quot;not picking winners and losers&quot; revamp. As soon as he changed those programs, all work on the site stopped. I guess it turns out slashing corporate taxes on the backs of working families and railroading the public does very little to actually attract economic development. Tue, May 7, 2013 : 4:17 p.m.
Who wants to bet they sell it for a prayer just to get out from under it? Tue, May 7, 2013 : 3:21 p.m.
Gotta say, again, ease up on the tight-fisted controls and micromanagement of developers. Ypsi has a poor reputation with developers. PUD doesn't look attractive given Ypsi's rep. Might could find a way to zone that place appropriately so by-right can happen. Tue, May 7, 2013 : 2:29 p.m.
Ok... So the property is up for sale for 9.2 million dollars.. The property has a 1.8 million dollar market value. It was purchased in 2009 for 2 million dollars. Ford and or Visteon paid for the cleanup at the site. Fabulous profits if they can find a city idiot to purchase . Tue, May 7, 2013 : 12:20 p.m. The city manager and all of the other self-proclaimed economic development experts on staff at the city should be making this a top priority. Stop all nonsensical invented projects and work on something that may actually have a huge impact on the community. Tue, May 7, 2013 : 10:40 a.m.
Was this company given tax breaks/incentives for the promise of bringing jobs? Tue, May 7, 2013 : 4:35 p.m. Thank you very much for the quick legwork and response, Ben. Appreciated. As sad as the shutdown was, it's good to see the state and Feds FINALLY had something shut down without taking a bunch of broken promise money with them. Tue, May 7, 2013 : 1:42 p.m.
Tue, May 7, 2013 : 1:23 p.m.
RUKidding, great question. None of AnnArbor.com's previous reporting on the company indicates any incentives or breaks, but I will look into that and get back to you.